WE ARE THE VOICE OF THE RIVER. We carry out our work by focusing on three themes. 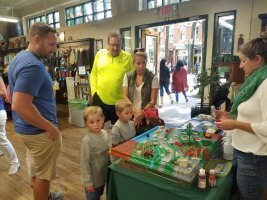 • Educating the community on the importance of a healthy river ecosystem. • Advocating for continued and improved protection for the river. Friends of the Reedy River’s continuing priorities are the conservation and restoration of land along the banks of the river and its tributaries, encouraging improved watershed management to minimize stormwater impacts and sedimentation, water quality monitoring, recreation resource development, and education. Friends of the Reedy River sponsors educational activities for audiences ranging from kindergarten to retirees. Our educational initiatives include river cleanups, speaking engagements and presentations, environmental poster contests, stormwater drain tagging projects, middle-school science fairs, high-school science projects, and post-graduate research. Friends of the Reedy River continues to lead the fight to promote restoration along the Reedy River, and to mitigate the impacts of major infrastructure projects in the Reedy basin. FoRR sits on committees and participates in stakeholder advocacy groups on the state and local level with the sole mission of protecting the Reedy. We monitor the quality of water in the river through in coordination with Adopt-A-Stream. We also pursue water-quality violations through letters, petitions, and public hearings and submit comment letters to state and federal agencies. With the help of other Greenville organizations and support of the Greenville community, FoRR was instrumental in preventing the development at 55 Camperdown. 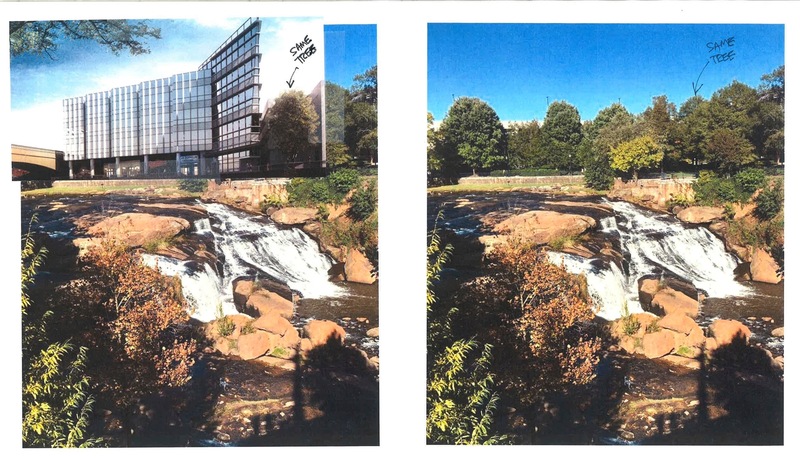 FoRR distributed a petition in opposition to the development and received nearly 1800 signatures, which was submitted to Mayor White and Greenville City Council. Friends of the Reedy River is a partner in the Reedy River Water Quality Group, a coalition of local city and county agencies, homeowners groups, conservation groups, and area citizens working together toward reducing the amount of nutrients flowing into the river. FoRR is also a partner in South Carolina Rivers Forever, a coalition of organizations, citizens and river users who believe healthy rivers make healthy communities. "South Carolina needs strong laws to protect our rivers and river users by ensuring sustainable, healthy flows. The Surface Water Withdrawal Act does not protect our rivers and downstream users from overuse by large farms. Our rivers and farmers deserve better. Help us protect them." We are also a partner in the Saluda Reedy Watershed Consortium promoting integrated watershed management and improved water quality. As a partner in the Consortium Friends of the Reedy River conducted workshops for city and county council members, elected representatives, power and sewer and water utility leaders, and developers to improve understanding of watershed issues. Friends of the Reedy River hosts multiple river cleanups each year including our Spring Cleanup and a Fall Riversweep. We also engage the public to help with restoration projects along the Reedy River and its tributaries. In 2017, with the help of 354 volunteers, FoRR removed 430+ bags of trash, 259+ tires, 4+ dumptrucks of large debris and organic matter from the river. Included in the items removed were 2 decorated Christmas trees, a carousel horse, wooden crate, traffic signal, 2 grocery carts, 2 bicycles, a stroller, a municipal trashcan, 6+ orange cones, a construction boom, a small TV, and a small engine! Learn more here. In 2015, FoRR adopted a 1-mile stretch of the Reedy River, calling it the Woodland Way Corridor. The Woodland Way Corridor is adjacent to the Swamp Rabbit Trail (SRT), a 20-mile multi-use greenway system, abuts one of Greenville's most popular parks, and shares riverfront with FoRR's community partners including First Baptist Greenville and the Caine Halter YMCA. The Cleveland Park Stables property is a part of the Woodland Way Corridor. The riparian area along this section of the river is overgrown with exotic invasive species that provide little benefit to native wildlife or bank stability. The Swamp Rabbit Trail (SRT) parallels the Reedy River along a 3,500-foot corridor between Woodland Way and East Faris Road. A number of public and private properties adjoin the trail and river here, including older developments characterized by significant impervious surfaces and a lack of stormwater treatment facilities. Stormwater runoff flows unabated through ditches, culverts, open channels or buried pipes that discharge directly to the river. Standing water is adversely affecting portions of the SRT. The riparian area is generally of low quality with a prevalence of non-native, nuisance, invasive plant species. Within this corridor, existing development, coupled with open land adjacent to the river and trail, provide the potential to develop a variety of demonstration projects for river improvement and protection. Collectively, these projects can serve as a model for water stewardship and sustainable watershed management practices. With over half a million people utilizing the SRT annually, the corridor provides an ideal platform for public outreach and education and the opportunity to make a major impact on the Greenville community. Become a key destination along the SRT. View our 2016 accomplishments here. View some of our past accomplishments here.